Welcome and transfer to Cusco airport to hotel. Tour the Sacred Valley of the Incas. (All day from 09:00 hrs - 19:00 hrs). Overnight at hotel in Cusco. Transfer from hotel to Cusco airport. Transfer to Juliaca airport to hotel in Puno. Transfer from the hotel in Puno Puno terminal. 2 transfer from Lima airport to hotel. 1 City tour to the "City of Kings." Flying a plane Arequipa - Lima. A transfer from Cusco airport to hotel. 1 Tour Inca Trail 4 days and 3 nights. 1 Transfer from airport to hotel in Puno Juliaca. A Tour of Lake Titicaca, Uros Island, Taquile. 1 Transfer from the hotel in Puno Puno terminal. Terminal 1 Arequipa Transfer to Hotel. 1 Transfer from Airport Hotel in Arequipa. 10 breakfasts at the hotels. 02 lunch buffets in Urubamba and in the Tour of Lake Titicaca. First day: City tour in Lima with a visit to the Huaca Pucllana. " Second day: City tour in Cuzco"
After breakfast at hotel, pick you up and took them to the airport in Lima, there are check and take a one-hour flight to Cusco "Archaeological Capital of America", then our staff will welcome and transfer from airport Cusco to hotel where we will have a mate coca.After lunch at 14:00 hrs will begin the guided tour that includes visiting the center of the ancient city of Cusco, the Plaza de Armas, the Cathedral, the Monastery of Santo Domingo, Koricancha Temple and the nearby ruins of Kenko, Puka Pukara, Tambomachay and the fortress of Sacsayhuaman, built with huge rocks that so far remains an enigma mobilization and use of these, there being no quarries in the area. At 19:00 hrs. (Photo: Plaza de Armas in Cusco at night). Third day: Tour to the Sacred Valley of the Incas. " This day we will tour the Sacred Valley of the Incas tour that started at 08:30 in the morning, collected from the hotel to Pisac, which is a typical market, with picturesque cultivated terraces on the mountain. Visit the archaeological site of Pisac. It is also famous for its fairs where you can buy beautiful handicrafts. Then we head to Urubamba where we have included a lunch buffet. Then we will go to the Fortress of Ollantaytambo, where descendants of the Incas living in the home of the Incas. Finally we went to Chinchero to see its market and the archaeological group with typical Spanish overlaps the Inca constructions. The tour had just averaging 19:00 hrs in the main square of Cusco. Overnight at hotel in Cusco. We get up early to witness the beauty of the mountains and breathe the fresh air that nature generously provides. After breakfast we continue our trek to reach the highest point open to "WARMIWUAÑUSCA" (where women died) to 4200 meters, where we will have a panoramic view of the snowy peaks, valleys and mountains circundantes.Continuaremos with the general decline Valley "PACAYMAYO" where we have the hot beverage service (mates), then dinner and finally comes the camp. Includes lunch and dinner. (Photo: Panoramic View trail). Breakfast at the camp, then we started the walk by a semitropical valley, overlooking the remains of Inca culture, strategically located according to the need for daily life of the Incas who inhabited the area, then start the ascent to Runcuracay archeological area 3.700 Sayacmarka msnm.Continuamos then to where we rest and have lunch. Then we continued our walk to Puyupatamarca (City Above the Clouds), impressive Inca City. Wiñaywayna continued over a 2.690 m located in jungle where we have dinner and camp. (Photo: Panoramic view of Puyupatamarca). 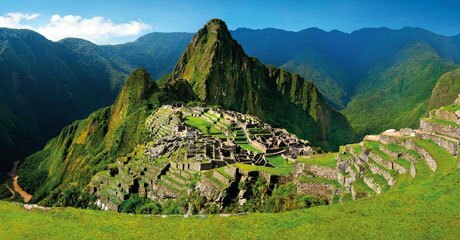 Seventh Day: Inca Trail and visit Machu Picchu. After breakfast at the hotel, have the day off to rest or if you want a recommendation can tour the city of Cuzco, visit a museum or church, the Mercado de San Pedro where you can see from another way, the culinary habits of the locals can also travel to a nearby town as those located in the Sacred Valley, an area that enjoys good weather and beautiful landscapes. Night hotel in Cusco. Ninth day: Air travel from Cusco to Juliaca and Tour Chullpas Sillustani. Breakfast at the hotel, featuring dran am free, to allow the purchase of handicrafts and souvenirs of their visit and may take to make one last journey through the streets of the city of Cusco. At noon the transfer to the airport in Cusco, to address their flight to the city of Juliaca. (Located 1 hour bus trip from Puno), the tour will take advantage of visiting Las Chullpas Sillustani, pre-Inca burial towers located on the shores of Lake Umayo, the highest is about 12 m. Upon arrival in Puno our staff will be waiting and take us to the hotel where spend the night. (Photo: Raqchi). After breakfast at the hotel, take some time off to visit the center of the city of Puno, at a time that will tell you the pick of the hotel and transfer to Bus terminal for your trip to Arequipa, we'll be waiting a notice with your name, we will tour the "White City" including the Convento de Santa Catalina, undoubtedly the gem of Arequipa, finally opened to the public in 1970, after having been for 400 years in prison, with countless pieces of colonial art. Also, visit the Plaza de Armas, the cloisters of the Society of Jesus and the neighborhoods and Yanahuara Cayma with a magnificent view of the volcano El Misti, and visit a traditional colonial house called the Founder's Mansion. Early morning departure by bus towards the Colca Canyon, past the foot of the volcano Chachani. During the trip, the ride through the pampas and Horsemen Cañahuas where are Vicuña National Reserve and Vizcachani, La Pulpera, Callalli, Tuti Sibayo and Villages. Reach an altitude of 4,000 meters above sea level where the flora and fauna will appreciate the beautiful natural lakes and Sea Bofedales Caught with giant rocks shaped castillos.A five in the afternoon arrival at Chivay Colca Valley. Accommodation in Valle del Colca. (Photo: Vicuñas on the plains of Arequipa). In the morning, heading towards the "Cruz del Condor, where the canyon begins to appreciate as its depth.From this point we can also see the condor in the wild.After a brief stop at the "Cruz del Condor", we will continue our journey through the Colca Canyon admiring the small towns of Pinchocclo, Madrigal, Lari, Maca, Achozen, Yanque, etc then return to Arequipa to rest. (Photo: Condor at Cruz del Condor in the Canyon Qolca). Bring a copy of the migration card (TAM) which will be delivered when entering Perú.